Place beef on baking sheet in single layer. Freeze meat until starting to harden around edges but sill pliable, about 35 minutes. Place one quarter of meat in food processor and pulse until ground into 1/16 inch pieces, about 35 one second pulses, stopping and redistributing meat around bowl as necessary to ensure beef is evenly ground. Transfer meat to second baking sheet. Repeat grinding with remaining 3 batches of meat. Spread meat over sheet and discard any long strands of gristle or large chunks of hard meat or fat. Season 1 side of patties liberally with salt and pepper. Using spatula, flip patties and season other side. Heat oil in 12 inch skillet over high heat until just smoking. Using spatula, flip patties and season other side. Heat oil in 12 inch skillet over high heat until just smoking. Using spatula, transfer burgers to skillet and cook without moving for 2 minutes. Using spatula, flip burgers and cook for 2 minutes longer. Transfer patties to rimmed baking sheet and bake until burgers register 125 degrees for medium rare or 130 degrees for medium, 3 to 6 minutes. Transfer burger to plate and let rest for 5 minutes. Transfer to rolls, add desired toppings, and serve. Follow step 1 of recipe for juicy Pub style Burgers. While beef is in freezer, heat ½ cup vegetable oil and 3 thinly sliced shallots in medium saucepan over high heat; cook, stirring frequently, until shallots are golden, abut 8 minutes. Using slotted spoon, transfer shallots to pepper towel lined plate, season with salt, and set aside. Proceed with recipe, topping each burger with 1 ounce crumbled blue cheese before transferring to oven. 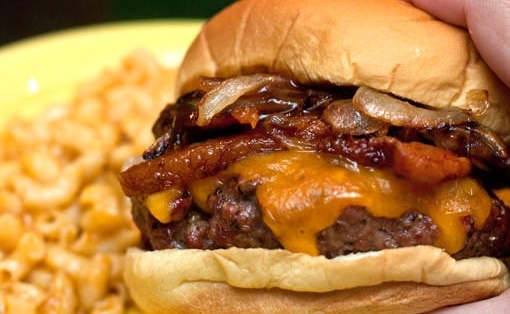 Top burgers with Pub Style Burger Sauce and crispy shallots just before serving. End.